I'm seriously considering starting my own at home childcare business. Every since my three year old daughter was born, I've been in "Corporate America" working a 9-6 job under someone else's thumb. I'd love to begin my own business doing something I absolutely love-loving and caring for children. The idea of being able to watch my own child grow is obviously appealing as well. I'm apprehensive to take that leap of faith and have parents that will trust me with their little ones, since I'd just be starting out. Any advise on starting this business and building a name for myself? I know exactly how you feel – you are where I was at 30 years ago! Being a stay at home mom and caring for children as a child care job sounds like the perfect solution for you. I firmly believe that parents need moms like you to care for their children. There is a lot of information for the new provider on the web site. 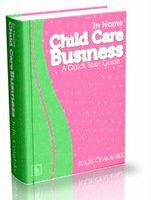 The demand for trustworthy, loving, and quality child care providers are the reasons I wrote my book: In Home Child Care Business. A Quick Start Guide!. The book is geared more towards someone considering becoming a provider and how to go about it step by step. The link above will take you to a page that describes what is in the book. It has my best advice on what you can do to get started, to be the one parents seek out, and building a name for yourself. I am so thrilled to be able to help you!